This event has already taken place. Thank you to all who attended! See videos of the presentations below. The Sacramento-San Joaquin Bay-Delta is a critical water source for the San Diego region, despite being hundreds of miles away. It can provide as much as 30 percent of our region’s water supply. The Bay-Delta is also an important ecosystem, supporting hundreds of fish, wildlife and plant species. However, the Bay-Delta is no longer a reliable water supply system, nor a healthy habitat for fish and other wildlife. Addressing the water supply and environmental issues will cost billions of dollars. This is a critical year for determining the future of this water supply for over 25 million Californians, including 3.1 million residing in San Diego County, yet many crucial questions remain: How big of a fix is needed? How much will it cost? Who will commit to pay for it? On January 16, the Water Authority joined a coalition of environmental organizations and water agencies to ask that state and federal officials study a combination of a much smaller conveyance tunnel and greater local water resource development as a stand-alone alternative in the Bay Delta Conservation Plan process. At this forum, you will learn more about this proposal, as well as other proposals under consideration, and their potential financial and water supply impacts to the San Diego region. This event is open to the public and there is no charge to attend, but space is limited and RSVPs are required. Light refreshments will be served. 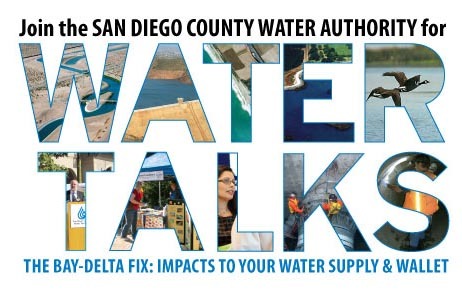 Thank you to our co-hosts SDG&E and the San Diego Regional Chamber of Commerce, for supporting Water Talks. Click here for more information on the Bay-Delta.